Are nicks, bumps and razor burn the bane of your existence? Shaving irritation is uncomfortable and unsightly. Most people simply want a basic shaving device without all the bells and whistles. This shaver doesn't make you use creams or water! 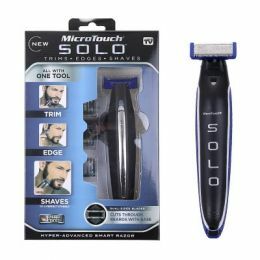 Add the Micro Touch Razor to your grooming rack! It'll give you the cleanest, smoothest shave you've ever had! No more skin irritation or nicks! The pivoting head is great for removing hair from any part of your body. QUICK SHAVE - No lathering creams or water, needed!